A few weeks ago, the owner of Babycakes in Richmond, Virginia, wrote to us to let us know about their shop. Then I found photos by Flickr user princesscupcake729 from yet another Babycakes, this one Babycakes Cupcakes in Quincy, Massachusetts. My take, as a cupcake blogger and observer, is this: Future bakery owners of America, do NOT name your bakery Babycakes! Sure, it's cute, and you could say cupcakes are baby cakes. But it's been done. A LOT. By my count, there are bakeries named some version of Babycakes in New York (with a branch opening soon in LA), Austin, Kansas City, Missouri, Sacramento, Richmond, Virginia, Torrance, California, and Quincy. Readers, what do you think? Are having too many Babycakes, or whatever the next cupcakery name du jour is, confusing, or do you not care? Please note - this is not about the taste of their cupcakes, but about creating a strong identity for your bakery, which lives, yes, in your town, but also online, and is part of a larger cupcake community. I believe it's better business to make yourself unique, have a great story behind your name, have a logo, and really own your name, whatever it is. Some of the above bakeries do play on the theme of "Babycakes" (like the above Quincy Babycakes photo which has "Babycake" written across their signature cupcake) and I'm not saying it can't be done, but I think 7 (and soon to be 8) Babycakes in this country is enough. Babycakes bakery owners - we'd love your feedback for a followup post! How'd you come up with the name Babycakes? How do you feel about the many other Babycakes bakeries that exist? Write to us at cupcakestakethecake at yahoo.com and we'll do another post next week on this topic, or leave a comment here. I'm looking to open a bakery in the next few years and have already picked a name. I'll probably purchase the domain soon since it's not yet taken. I spent HOURS compiling a list of potential names, searching the web for existing companies (not just bakeries) by the various names, and asking the people of my life how the different names would make them view the establishment. I also noted next to the names how many listing there were for a google search of the name. Some bakery may not have the name, but searching for your place could bring up all matter of other sites. ;) I found that many of the ideas had been used already, and some such as babycakes had many takers. To me, the name of a place is very important. Especially if you are going to be broadcasting to a large market. If you just want to attract locals walking by in a small town your business will have more of a chance to speak for itself. But I know that when looking for businesses online or in the phone book I carefully consider them based on their name. So yes, there are too many Babycakes. Babycakes Austin is closed, so there's one less in the mix to fret about. I heard they were super expensive. The owner of the shop needs to go with a name they love and believe in, completely! If Babycakes is that name then so be it. Babycakes of Soho, Babycakes at Preston Center Mall, Babycakes of Limerick. I don't know if I like Babycakes as a name for a bakery...it puts you in a stereotype. Do you not bake bread? Wedding cakes? Adult Cakes? I did enjoy the one Babycakes Bakery I came across at a Baby Expo...they rolled uber lux burb clothes, snuggle blankets, wash clothes, bibs and other baby things up as cupcakes, sweet rolls, etc (NOT your average diaper cake) then had their display set like a french cafe. I was in love! but knew what babies did to $40 burp clothes so had to pass. The big question I have is if anyone owns the rights to the name. If so, that should resolve the question right there. Personally I would not want to risk getting sued or if not sued, simply confusing customers who might think you are affiliated with another bakery. Originality is key in marketing a small business, so I can't imagine anyone picking a name without doing thorough research. Babycakes is *SO* gag-me-overdone. Get original, for cryin' out loud! Besides the fact there is a zillion of 'em, its way too cutesy. Blech. It's Nichelle, fellow cupcake blogger, as well as a small business blogger. It's not our duty to tell anyone what they should name their bakery, but I can tell you from reading up on trademark law that "babycakes" is too generic to be trademarked. This would make it difficult to protect, so I would all business owners to create an original name for their business. there's a site, http://namethis.com that can help. I would encourage all business owners to seek out an original name. The Babycakes in Quincy MA is fantastic even if the name's a bit overused ;) I'd recommend it highly, including their french toast cupcake (okay, it's more bread pudding, but that's quibbling LOL). 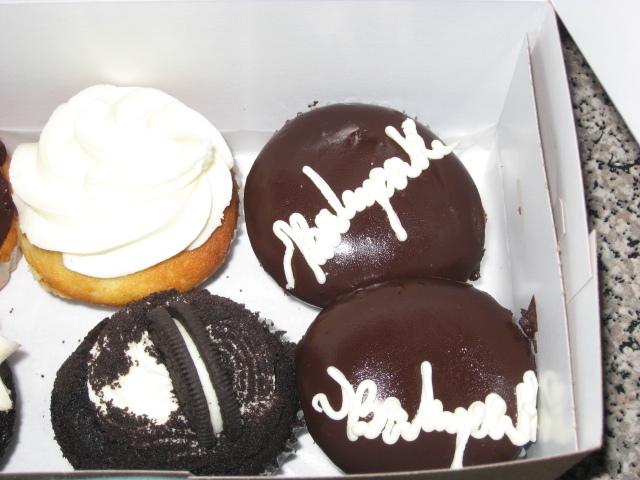 I LOVE Babycakes in Quincy, MA! Matter of fact, that is where my bridesmaids got my Red Velvet cupcakes for my "Breakfast at Tiffany's" themed bridal shower. The cupcakes were beautiful and tasty and made great centerpieces. All my guests loved them! Despite the overuse of the the name "Babycakes", well there is only one in MA and having that name is fine by me. It's cute and easy to remember. The name may be overused, but I have to agree with the last 2 comments.. Babycakes in Quincy is DELISH! We don't have a barage of cupcake bakeries in MA at the moment, so I don't care what they call it as long as it's good stuff! In my opinion, it really shouldn't matter that there are 7 or 8 bakeries throughout the 50 states with the same name. It's highly likely that most are locally owned and operated and the patrons likely have never heard of the other bakeries outside of their local communities. If it is catchy and appeals to the targeted audience, does it really matter that the name lacks originality or is being used in other parts of the country? Like most things, it's all relative. Well to be fair, the Joe's Plumber's deal isn't quite the same. It's not as though they're naming their bakery Mary's Cupcakes. Plus, when you're looking for a plumber, the name doesn't seem nearly as important as it does in the world of baked treats. That being said, Babycakes is cute and all, but it is, indeed, overused. there is Babycakes in Australia too!!! They've got a cupcakes happy hour, kind of fun! Babycakes in San Diego have the best cupcakes I've tasted. And it's really super cute to see super handsome, gay grown men wearing t-shirts with "BABYCAKES" emblazened across their chests as a bonus. Hi! Love the site. Interesting, I named my bakery after my daughter Alexis. Due to her severe allergies to dairy, egg, tree nuts and peanuts I had very few options and decided to make a go of it. Now we make and ship delicious cookies, cakes and more that are safe for those with these partictular food allergies.